The heart is a vital organ that needs to be working every minute of every day to sustain life. You can only survive a few minutes at most if your heart stops functioning. And whether you are awake or sleeping, your heart never stops beating. But like any organ in the body, the heart is prone to different types of diseases. All of these heart problems can eventually lead to death if the heart stops functioning. However, modern medicine has now allowed for people to live long and productive lives even with heart problems. Understanding how these heart diseases differ and the symptoms of each can mean early diagnosis and proper treatment. Coronary artery disease (CAD) or ischemic heart disease (IHD) is one of the most common heart problems worldwide. The problem lies in the coronary arteries which carry blood to the heart wall. Most of the heart wall is made up of thick muscle which keeps the heart beating. It needs a constant supply of oxygen and nutrients to function properly. When the coronary arteries become narrow, the blood carrying oxygen and nutrients is gradually restricted. This narrowing is due to the build up of fatty plaques in the wall of the arteries (atherosclerosis). It occurs gradually over months, years and even decades. Cardiac chest pain initially during physical activity and psychological stress (angina pectoris). Pain that eases with nitrates (angina medication) and rest. A heart attack is a condition where a portion of the heart muscle dies usually as a result of insufficient oxygen supply. It is one of the consequences of severe untreated coronary artery disease. Initially the restricted blood flow causes injury to the heart muscle (myocardial ischemia) but when the restriction is severe it leads to muscle tissue death (myocardial infarction). 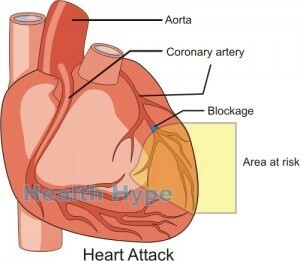 Usually a blood clot suddenly blocks the already narrowed coronary arteries thereby leading to a heart attack. It therefore often strikes suddenly although a person may have symptoms like angina pectoris for months or years before. Cardiac chest pain that typically extends to the left arm, neck or jaw. Pain does not resolve with nitrates and rest. There are four valves in the heart which ensures that blood only flows in one direction during its passage through the heart. 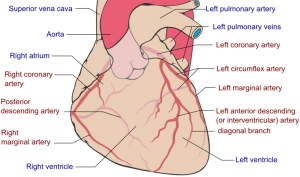 These valves are like flaps of tissue which open and close either during contraction or relaxation of the heart. In heart valve disease, these flaps are either not able to close fully (insufficiency) or open properly (stenosis) thereby allowing for blood to flow backwards or be restricted in its movement. Defects with the heart valve may be present from birth (congenital) or develop during the course of life (acquired). It can exist for decades with no symptoms and sometimes may pose no significant problem throughout life. The heart normally beats in a rhythmic manner, sometimes faster and sometimes slower. This coordinated beat is maintained by the electrical conduction system of the heart. It ensures that impulses travel in a way that the atria beat first, followed by the ventricles. When the heartbeat becomes irregular, the condition is known as an arrhythmia. Sometimes an arrhythmia can occur on its own when the heart’s electrical system becomes diseases but it can also arise as a consequence of other heart diseases such as coronary artery disease, a heart attack and heart valve disease. Severe arrhythmias can be life threatening within minutes but many can last for years or decades. Cardiac failure or heart failure is when your heart cannot pump as it should. It gradually becomes weak and blood cannot be circulated throughout the body as normal. Cardiac failure is a consequence of other heart conditions like a heart attack and arrhythmias but may also arise with thyroid disorders, diabetes mellitus, lung problems, severe infections and even with using certain medication over a long period. Alcoholism and illicit drug use can also contribute to heart failure. Since the body has mechanisms to compensate for reduced heart functioning, the condition can persist for months or years before it can be symptomatic. Cardiomyopathy is a disease affecting the muscle of the heart (myocardium). There are several different types of cardiomyopathy which affect the heart muscle in different ways. Some of the changes that occur is that the heart may become enlarged and/or the walls thickened. Cardiomyopathy may arise with certain heart conditions like coronary artery disease, with long term hypertension, after a heart attack or it can be caused by substance abuse, with the use of certain drugs and may be related to diabetes or thyroid problems. The symptoms largely overlap with other heart problems and the condition can only be conclusively diagnosed with imaging studies (x-rays or scans). 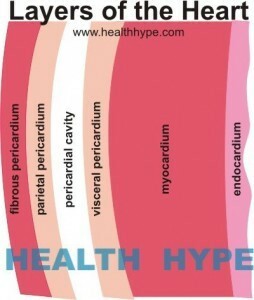 The heart wall is primarily made up of thick muscle known as myocardium. When this myocardium becomes inflamed, the condition is known as myocarditis. It may occur on its own or arise with pericarditis, inflammation of the lining around the heart. Often the cause of the inflammation cannot be identified. However, infections play a major role in the condition. The heart muscle may become infected with viruses, bacteria, parasites or fungi. A number of different medication and some illicit drugs can also lead to myocarditis. Although rare, the condition may also arise as a result of certain autoimmune diseases.